PowaKaddy Compact C2i Golf Trolley (18 Hole Lithium Battery): The all-new Compact C2i from PowaKaddy built on the success of the popular C2 range the new i model incorporates the latest technological advances and innovations. Advances on the previous C2 range include a Full 2.8” Colour Widescreen – a new premium quality high-performance power chassis with a low profile for added stability, a unique gunmetal Silver finish and ultra lightweight durable Alloy frame. 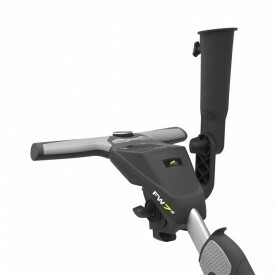 PowaKaddy’s thinnest plug and play Lithium Battery powers the powerful motor and is the quietest motor on the market, automatic distance function (ADF) comes standard; this allows the user to choose and set the trolley to travel unaided between 15/30 and 45 yards. The C2i is a stylish looking trolley that performs amazingly and integrates a storage compartment that houses a scorecard holder and as a compartment for balls and tees etc. The C2i features PowaKaddy’s higher ground clearance, this makes light work of any terrain, and the C2i ensures that if space is at a premium the quick folding mechanism and compact design are ideal. 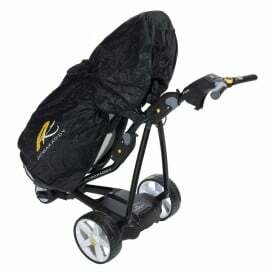 The build quality as always with PowaKaddy trolleys is unrivalled and the C2i is extremely user-friendly, the trolley folds and unfolds with ease and can accommodate most sizes of Golf bags with comfort. The C2i weighs only 9.4kgs without a battery fitted and 1.8kgs extra with a 18 hole Lithium battery. The addition of a full 2-year trolley warranty and a 5-Year Battery Warranty on the PowaKaddy C2i can leave you in no doubt that a PowaKaddy is the Right Choice. A PowaKaddy Compact C2i 36 Hole Lithium Battery Option is also available - click here for more info. Folded 514mm (H) X 349mm (W) X 560mm (D). Open 880mm (H) X 1220mm (W) X 560mm (D) (Lowest setting). Open 950mm (H) X 1220mm (W) X 560mm (D) (Middle setting). Open 1000mm (H) X 1220mm (W) X 560mm (D) (Highest setting).